She was born in Chicago (March 20th 1989). 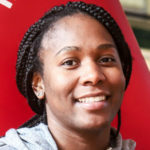 She graduated from Michigan University, being one of the top 25 players who scored more than a 1.000 points and one of the two top players who grabbed 1.000 rebounds. She competed with the Swedish team Norrkoping, and since 2013 she became part of three Greek teams: Elliniko BC, Faros Keratsiniou BC and Olympiacos BC. This is her second spell with the red and white».